There has been a recurring theme going on in my life right now. Last week I attended a bible study and the title was called "Resting in God". Last week I received in my email a devotion asking me to have a more "Mary and Less Martha Thanksgiving" by the InCourage Website. So this weekend as I approached a week of Thanksgiving festivities with family flying into town, I decided to put down the paintbrush, broom and laundry basket along with the never-ending to do list and push the pause button. Knowing I would not get everything done without getting to the point of complete exhaustion and losing sleep, I decided to make peace with whatever didn't get done. I knew my family coming wouldn't mind some of the outdated wallpaper still lingering on some walls. Nevermind the laundry mountain that grew from being washed, but somehow never seemed to find its way back on the hanger. I felt God telling me to stop and embrace the season I am currently in and that is THANKSGIVING! Stop and enjoy life in my new home with my family and be grateful! There is no better way I can show my gratitude for my family, friends and home than truly ENJOYING them! 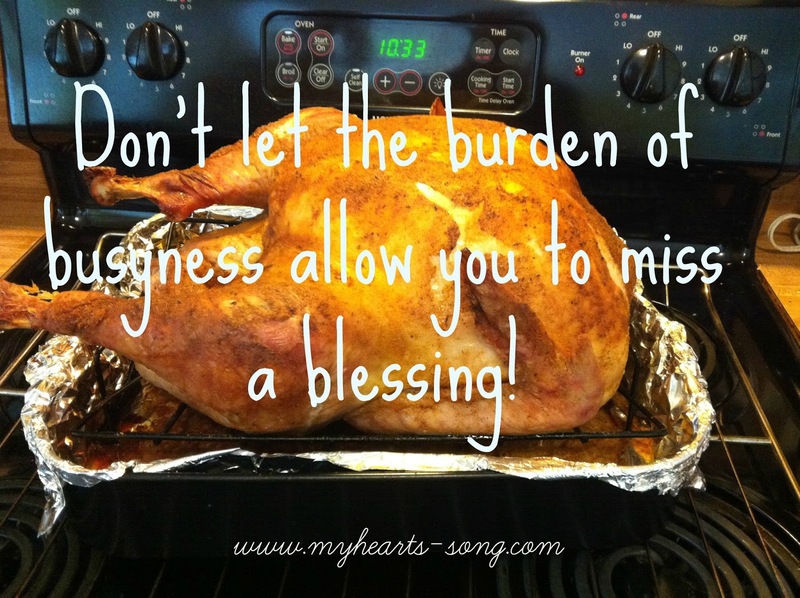 Don't let the burden of busyness allow you to miss a blessing! If I kept stressing and fretting over what I didn't get done and what I still needed to do, I would never have been able to truly enjoy myself this week and those around me. So here I am pushing the pause button on the never ending to do list and telling it to back off for a while! You will always have dishes to wash in the sink and towels to fold, but you won't have some of those precious moments with family and friends back. 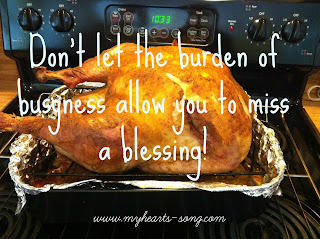 Enjoy your blessings, rest in knowing God and your family loves you even if you don't have everything "done". Inhale, exhale....BREATHE! Push the pause button and take the time to make memories with your family this week, not just pumpkin pies.